Home BOLLYWOOD Olympic Level Boxers Fly Down To The City To Watch Saala Khadoos! Olympic Level Boxers Fly Down To The City To Watch Saala Khadoos! [tps_footer]Two real life boxers Sarjubala Devi and Sarita Devi from Manipur will also be attending the preview of the film. Both the female boxers are Olympic level boxers. While Sarjubala Devi after a successful achievement inYouth World Women Boxing Championship organized at Turkey, the Olympic Gold Quest (OGQ) announced to support Sarjubala Devi in 2012: Sarita Devi is a national champion and a former world champion in the lightweight class. 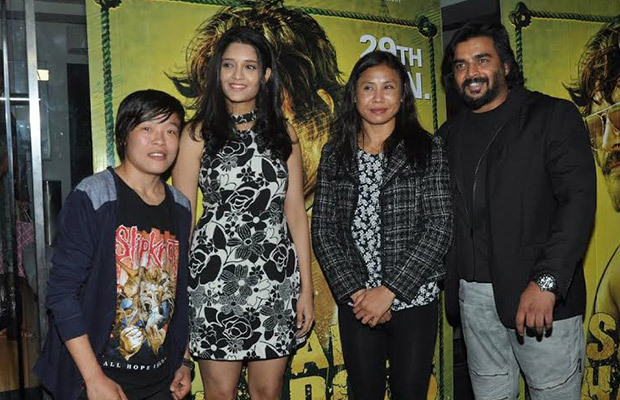 Both the boxers were keen to watch the film and lend their support to the lead actress of Saala Khadoos, Ritika Singh, a fellow boxer. After watching the female boxers were of the opinion that Saala Khadoos would encourage female participation in the sport. Sarjubala and Sarita both were overwhelmed that a Producer of Rajkumar Hirani‘s stature has been associated with a sports oriented film. Saala Khadoos is a sports film, featuring R Madhavan as a badass coach who relentlessly pushes his protege played by Ritika Singh to overcome obstacles and achieve her boxing goals. Previous articleKatrina Kaif’s Comment On Being With Salman Khan On Bigg Boss 9! Next articleModern Family Star Sofia Vergara Files A Lawsuit Against Beauty Brand!